The interpretation of a single word appears to be a persistent concern for the Poarch Band of Creek Indians (PCI), which has made a significant effort in recent years to clarify the status of its federally recognized trust lands and the privileges associated with them. While it may seem like a silly question to ask more than 30 years after PCI was formally recognized, a 2009 ruling by the Supreme Court of the United States (SCOTUS) has left dozens of Indian tribes across the country in a legal gray area and looking to a divided Congress for relief. The issue goes back to the Indian Reorganization Act of 1934 (IRA), which established a process for the U.S. Secretary of the Interior to take land into trust for recognized Indian tribes. Eighty-three years later, more than 8 million acres of “Indian land” have been taken into the trust, including roughly 460 acres owned by PCI, which became Alabama’s only federally recognized Indian tribe in 1984. In a 6-3 vote, the court ruled the term “now under federal jurisdiction” in the IRA “unambiguously” referred to tribes under federal jurisdiction when it was enacted in 1934 — meaning the Secretary of the Interior lacked the authority to take land into trust for the Narragansett tribe, which was recognized after 1934. While there is still debate on what impact the ruling has on land taken into trust for other tribes, it has continued to call into question dozens of land acquisitions from the past 80 years, including lands taken into trust for PCI in the 1980s and 1990s. Several states have cited the Carcieri ruling in legal challenges against tribes, some of which have been successful. In Alabama, however, two federal claims have gone so far as to challenge whether PCI’s recognition as a tribe in 1984 was valid, and in both cases the 11th Circuit Court of Appeals returned rulings favorable to the tribe. The most notable case was an attempt by the state of Alabama to enforce gambling laws on trust land housing PCI casinos. In its analysis, the 11th Circuit noted that Carcieri started as a challenge under the Administrative Procedures Act (APA) to review a decision of the Department of the Interior, while Alabama had never raised a similar claim about PCI trust land. “We find persuasive the opinion of the Ninth Circuit, which recently held that California could not raise a collateral attack — that is, make a challenge outside an APA claim — to the Secretary’s authority to take lands into trust for an Indian tribe,” Judge Jill Pryor wrote. Because there is a six-year statute of limitations for challenging the actions of federal agencies under the APA, Pryor said, even if Alabama filed an APA challenge over the acceptance of PCI’s trust lands, it should have done so by 1991, 1999 and 2002, respectively. While there are exceptions for bringing later challenges, Pryor said those are intended for parties unable to bring a timely administrative challenge. Because Alabama did not challenge the land acquisitions when they were approved years ago, the court refused to “carve out an exception” so it could contest them now. Reached by Lagniappe, PCI declined to comment, but in 2015 a tribal spokesperson told the Montgomery Advertiser the 11th Circuit’s decision reaffirmed that “the [U.S.] holds the lands where the Tribe’s gaming facilities are located in trust for the benefit of the Tribe and that those lands ‘are properly considered Indian lands’” in spite of the Carcieri ruling. Yet, based on its political spending, PCI has continued to lobby for a “Carcieri fix” in Congress, which appears to have led to a substantial increase in its donations to candidates in federal elections in recent years. According to the Center for Responsive Politics, PCI spent just $20,000 lobbying at the federal level in 2007, but in 2008 — the year SCOTUS agreed to hear the Carcieri case — that number jumped to $305,000. In the past two years, PCI’s lobbying expenditures have topped $400,000, and as of June 2017 it has put $217,000 toward its federal legislative agenda. In 2015, PCI lobbied for the passage of H.R. 249, which would have clarified the issues raised by the Carcieri ruling for all Indian tribes recognized after 1934. Of the bill’s 39 cosponsors, U.S. Rep. Bradley Byrne was the only one from Alabama. 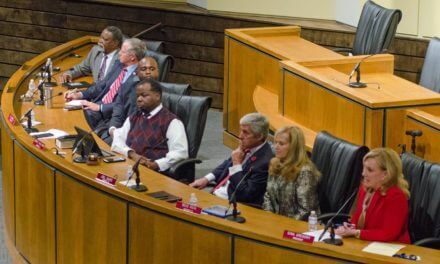 Byrne, whose district includes Escambia County, has since introduced multiple bills that would “reaffirm” that 460 acres in Alabama and Florida are “taken into trust” for PCI and are “subject to valid existing rights” under the IRA. In the 2015-2016 election cycle, Byrne also reported at least $10,400 in direct contributions from PCI. Byrne’s most recent effort to clarify Carcieri expressly states that it applies to all pending and future challenges to the acquisition of PCI’s trust lands — meaning were it to pass, it would nullify a lawsuit that’s been pending before the Alabama Supreme Court for three years. That case is challenging PCI’s right to evoke sovereign immunity to prevent being sued in state and federal court. In a legal context, sovereign immunity simply means PCI is treated as a sovereign state or country. Thus, it can’t be sued in state or federal court, which lack jurisdiction over the tribe, even if it’s being sued for something that occurred off tribal lands.